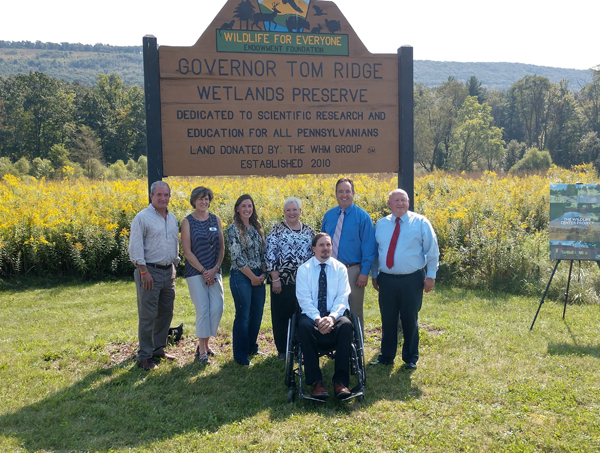 The Wildlife for Everyone Foundation will receive $250,000 in state funding toward Phase 1 of creating a wildlife center at the Governor Tom Ridge Wetland Preserve. Too often we take for granted the restorative aspects of spending time in the great outdoors. This phase includes a mile-long ADA-compliant trail will be a national model. I am very proud to support this project and promote wildlife conservation in Pennsylvania. The Wildlife Center will include construction of the trail and boardwalk loop, observation areas, pavilion, restrooms, benches and signage. The state grant is coming from the Commonwealth Financing Authority (CFA) and its Greenways, Trails and Recreation Fund. The total project cost is $575,000. Studies show those who can benefit from it the most often are kept inside due to physical limitations that make getting out and connecting with nature difficult. By creating a trail and wildlife center that is accessible for everyone, the Wildlife for Everyone Foundation will ensure that more people can enjoy this wonderful community resource and take advantage of all that it has to offer. The center also will have an economic impact on the region, stimulating our local economy on an ongoing basis. From concept to design to construction, building this facility will provide family-sustaining jobs for our region. By creating a first-rate facility that is accessible to all, the Center will attract visitors from across the state, the country and possibly even the world. Those benefits will trickle throughout our community. You can watch WTAJ coverage of the announcement. 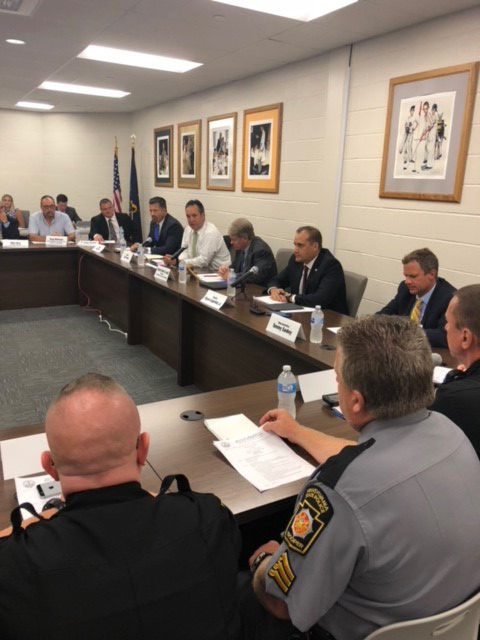 I joined Senator Wayne Langerholc Jr. and the Senate Majority Policy Committee in hosting a public roundtable discussion on school safety. This discussion is part of the Senate’s commitment to engage students, parents, school personnel, security professionals and community members in order to develop a holistic approach to creating safer schools. We have taken the first steps to increase access to tools the schools need to increase safety and will continue to look for ways to ensure a safe learning environment for our children. The committee, chaired by Senator David G. Argall, has been traveling across the state, conducting similar events with stakeholders. During the roundtable, we reviewed recently enacted school safety legislation, as well as discussed pending measures awaiting action in both the state House and Senate. Most of the discussion focused on new ideas from the regional stakeholders, consisting of administrators, law enforcement personnel, students and other individuals involved on the issue. Thompsontown Borough will receive $18,173 in state funds to address drainage issues at Haldeman Park. This is a beautiful community park with walking trails, playgrounds and sports fields. Making these improvements to the drainage will deal with an issue of standing water and concerns about possible mosquito-borne illnesses. The grant was awarded by the CFA under its Greenways, Trails and Recreation Funding Program. The Borough plans to install a new inlet drainage box and piping as well as reseed the area between the walking trail and ballparks. The total project cost is $21,380. Dairy farmers throughout Pennsylvania have been struggling for years due to challenging market conditions and low prices for their product. A new grant program that was created in June will provide $5 million in grants to support the dairy industry. The Pennsylvania Dairy Industry Investment Program will support investments in projects to improve the production, processing and distribution of dairy products throughout the state. Grants of up to $100,000 will be available for research and development and marketing projects, and grants of up to $50,000 will be offered for value-added processing projects and dairy operations transitioning to organic products. Funding is only available for projects that are not already underway; commencement of work on a project before receiving final approval will result in the project being deemed ineligible for funding. 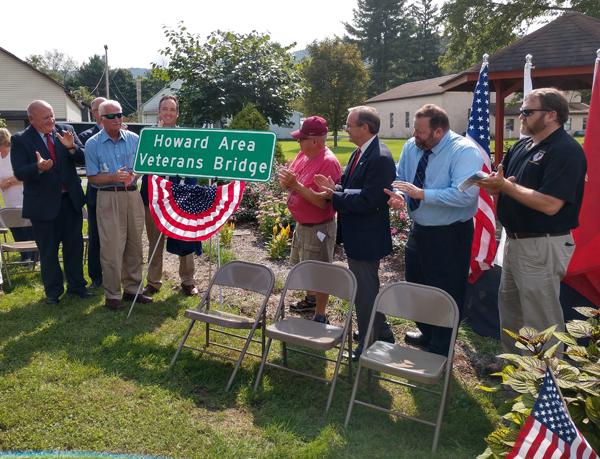 Thomas Jefferson said “Eternal vigilance is the price of liberty.” Each time we cross this bridge, we will remember the veterans that unselfishly served our country. Thank you to everyone who has served our nation. We can never say it often enough. A $150,000 state grant has been awarded to the Western Pennsylvania Conservancy to use toward purchasing land in Centre County for a recreation area that will provide public access to outdoor recreation opportunities. These funds will contribute to the vitality of our community by playing a significant role in creating an area for hiking, hunting and fishing. It’s important that we preserve our outdoor areas so we all have the opportunities to step away from our hectic lives and enjoy our region’s beautiful natural resources. The grant was awarded to the Western Pennsylvania Conservancy by the CFA under its Greenways, Trails and Recreation Funding Program. The Conservancy, which is dedicated to preserving green space, plans to purchase about 263 acres of land adjacent to the Bald Eagle State Forest in Haines Township, Centre County. The property includes about a mile of frontage on Penns Creek, which is a trophy trout stream, and a one-mile stretch of abandoned rail corridor that is a key link between the Centre Region and the Susquehanna Valley. It also links both regions to the Mid-State Trail. The total cost of the project is about $1 million.